The Organization for Economic Co-operation and Development (OECD), established in 1961, is an international non-profit whose mission is to promote policies that will improve the economic and social well-being of people around the world. The OECDs most recent study estimates that only 43% of citizens around the world trust their government. The Pew Research Centers most recent study indicates less than 30% of Americans trust our government. According to a poll conducted by Gallup in the same year says that only 25% of Illinois residents trust their state government, and that we have the nations lowest confidence in (our) state economy. Its easy to understand why Illinois families are skeptical of our state government. Take for example, Senate Bill 2892. This bill created a statewide threshold for paying teachers, including mandatory raises. Sounds good right? School superintendents in the 89th District called my office in an uproar because the bill did not include state funds or a method to pay the salary increases and corresponding benefit costs. The only way to cover these additional costs would be for the local school districts to raise your property taxes. The Chicago machine was hoping Illinois families would blame school board members for the tax hikes. I support fairly compensating our teachers. I think most of us do. I voted against SB2892 because increasing property taxes would hurt hard working families and senior citizens in our district. Some people may not care if you have to pay more property taxes. I do. Another example why people in Illinois deserve to be skeptical of their government is Medicaid. Illinois accepted the Medicaid expansion in July 2013 and it went into effect in 2014. According to healthinsurance.org, the increase in number of people covered by Medicaid between the start of the expansion and June 2016 was 461,505, bringing the total number of persons covered by Illinois Medicaid to 3,088,448. Healthinsurance.org estimated an additional 782,000 patients would become newly eligible for coverage after June 2016. The costs for the Medicaid expansion are significantly higher than the projections. In 2013, former Governor Quinn told us that the expansion would cost $4.6 billion during the first three years. It turns out, he was off target. 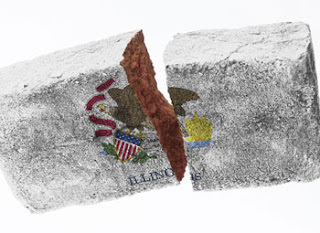 The expansion cost Illinois families $9.2 billion. It would make sense, given the enormous unanticipated costs to cover the additional patients that we should try to audit patient eligibility and make sure our tax dollars are being used to cover patients who actually qualify and are eligible for Medicaid. After all, the US Department of Health and Human Services estimated that nearly 10% of Medicaid spending was improper and state law requires the Illinois Department of Healthcare and Family Services (HFS) to conduct annual eligibility checks. The same year Illinois approved the Medicaid expansion, the legislature voted to allow HFS to contract with independent experts to audit the eligibility for all Medicaid participants. Of the first 195,000 Medicaid patients reviewed by the vendor, 64% had eligibility errors. 101,000 patients did not qualify, and an additional 23,000 were eligible for some benefits but werent enrolled in the right program. This was before the Medicaid expansion even started! The audit was stopped after union bosses went to arbitration. They said the state shouldnt contract an outside auditor to do union jobs. The bosses wanted public union employees to conduct the audit. So the Quinn administration halted the audit. In the 1980s I had the honor and privilege of being elected the union president of the Stephenson County public employees, UAW Local 2261. I would never have suggested that only our union employees were qualified to audit ourselves, and would have encouraged our members to welcome any independent investigation of our job performance. The Chicago machine did nothing to try and reduce the burden on taxpayers and make sure that Medicaid benefits are going to people who truly need the help. This is the kind of thing we need to overcome if we are going to get Illinois back on track doing the right things for hard working families. I agree with Elvis Presley. Truth is like the sun. You can shut it out for a time, but it aint goin away. I believe we need to restore confidence in Illinois. We deserve a state government that you can trust. It has been my mission as your State Representative to support, sponsor, and vote for common sense solutions that provide for balanced budgets, to resist tax increases without a commitment to responsible spending, and to secure jobs for working families. I believe doing so will help you have more faith in our state government.